If you want a tight little unit that looks cool, works seamlessly with Bluetooth, and will play for hours on end without a charge, the Hidden Radio just might be your favorite new toy. One of the hardest parts of getting any new business off the ground is finding someone to invest in your big idea. That’s where Kickstarter comes in. For those not familiar, Kickstarter is a website dedicated to helping creative projects get the funding they need by making them available to millions of potential contributors. Those who believe in a project, be it music, art, or technology-based, can donate an agreed upon sum to help the project reach it’s creator’s goal. If the project reaches the goal, all donors share in the success in some small way. If it doesn’t make it, no one is charged. One successful project spawned from Kickstarter’s brilliantly simple formula is the Hidden Radio Bluetooth speaker, which recently made its way to our desk. Developed and designed by a pair of industrial engineers, the Hidden Radio is a small capsule of sound, noted for its extreme portability, minimalist design and intuitive operation. It’s currently available on Hidden Radio’s website for about $150. We spent some time with the little sonic cylinder to find out whether its 5,000 or so donors got their money’s worth. Here’s what we discovered. Opening the Hidden Radio’s box revealed a platform of separated cardboard with 4 lanes of accessories including: a shiny vinyl carrying bag, a USB to mini USB charging cable, an FM antenna cable, and a 3.5mm aux input cable. Putting aside the accessory tray, we found the Hidden Radio beneath, proudly showing off its charcoal-grey matte finish. The Hidden Radio is incredibly small and lightweight. At first glance, the device looks a bit like an oversized thermos cap from the future, or a 21st century Yahtzee cup. The Hidden website offers it in white, black, and metallic silver – oddly enough, we don’t see the charcoal-grey version we were sent for testing. There are no buttons, dials, switches, or inputs on the devices smooth exterior, just a single square LED indicator. To power up the Hidden Radio, you simply twist the capsule’s top in a clockwise motion. Doing so raises the top to reveal the speakers beneath, covered by a rubbery speaker screen that wraps around the base. Immediately after turning the top, the Hidden Radio comes to life, with volume increasing as the lid rises. Flipping the Hidden Radio over, we found its small control center consisting of a switch to toggle between the speaker’s FM, auxiliary, and Bluetooth inputs, and two small arrow buttons which scan up and down the FM band for radio stations. The bottom of the speaker is lined with a grip pad that keeps the unit in place on hard surfaces as you spin the top like a giant volume knob. A hole in the center harbors the mini USB input for charging, as well as the 3.5mm input which serves a dual function as input for either the radio antenna, or an auxiliary cable. The Hidden Radio’s Bluetooth adapter paired to our iPhone 5 with ease. 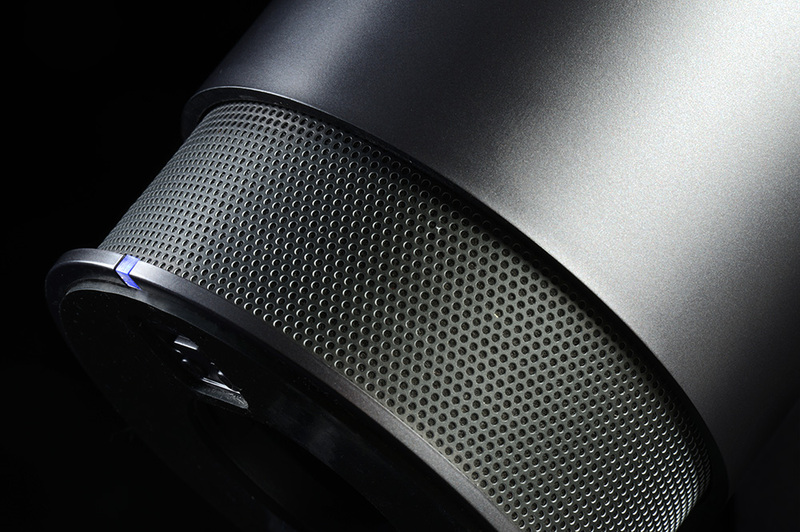 As we queued up our favorite Pandora station, clear sound emanated equally from all sides of the Hidden Radio through its mysterious “360 degree sound diffuser” — no specs are given regarding the speaker’s drivers or amplification, however. We never approached the promised 15 hour battery time in our testing, but we did listen to the Hidden Radio speaker using all three inputs for several hours without needing to recharge. 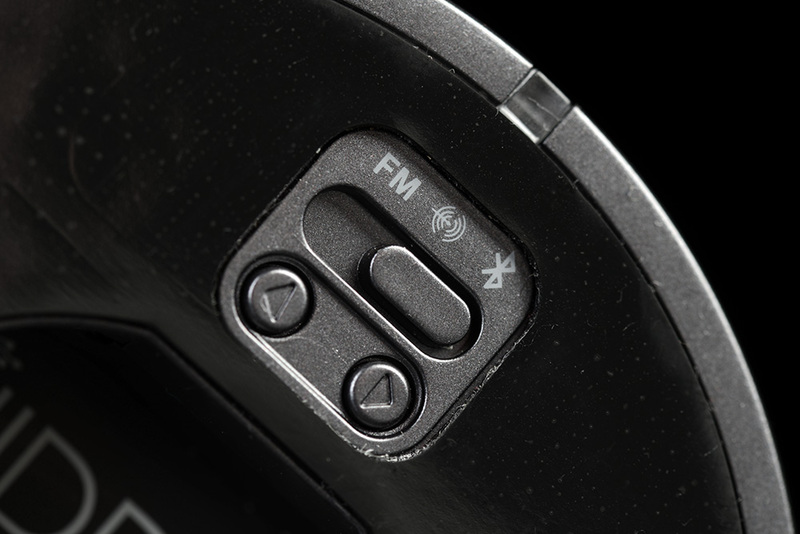 While the Hidden Radio’s minimalist design may be clever, it raises a few practical issues while listening to FM radio. First, there is no FM station indicator, so users must search for stations blindly. Second – and more importantly – raising and lowering the speaker’s volume with the extendible cap also reveals or covers the drivers, meaning you can’t lower the volume without also muffling the sound. However, these problems are moot when utilizing either the Bluetooth or Aux inputs, since volume can be controlled by the source in these instances. All of that said, when we needed to quickly silence the Hidden speaker during holiday gatherings, we came to appreciate the smooth, fluid motion of the knob control over fumbling with buttons, or searching for our phone. The sound quality of the Hidden Radio is neither outstanding nor terrible. Listening to a long list of tracks from our music catalog, as well as Pandora and FM radio, we found the Hidden Radio a fairly pleasant purveyor of ambient music, and the device’s clever design and wireless connection made it a fun and convenient piece of gear to use, overriding some of its audio shortcomings. Humans hear things best between 1-4 kHz in the frequency spectrum, and that midrange area is where most of the Hidden Radio’s sound seems to be focused. Vocals were generally very clear and forward in the mix. Piano and clean guitar tones were also reproduced well, especially when panned out from the center (though the overall color of the sound could get a bit tinny at times). But when things got to rocking on heavier tracks, we found the speaker’s coherency fell apart as there was a tendency for the speakers to distort. In fact, pretty much anytime we turned the iPhone up to full volume on heavier tracks, distortion became an issue. We had our best experience with the Hidden Radio while listening to acoustic-based music or jazz, with the volume at a medium to low level. The drivers did a good job of presenting a clean mix of the midrange as long as we didn’t bump the volume too high, and we never felt the treble got too sharp or shrill. We also liked the fact that sound was reproduced equally on all sides from the Hidden Radio’s proprietary drivers. It was cool to be able to walk around the office or kitchen, or sit around it in a circle and hear the same mix from every angle. The Hidden Radio’s unique design, portability, and clever 360 degree sound pattern make it a cool little device. While we weren’t wowed by the sound from the Hidden Radio, we will concede that it did a decent job for its size. Those looking for deep bass, or loud, full rock mixes from the Hidden Radio’s small drivers will be disappointed. But if you want a tight little unit that looks cool, works seamlessly with Bluetooth, and will play for hours on end without a charge, the Hidden Radio just might be your favorite new toy.